The UK job market weakened rapidly in November as permanent placements declined at a record rate, a new survey from Markit Economics suggests. The drop in permanent and temporary jobs was the fastest recorded in the survey's 11-year history. 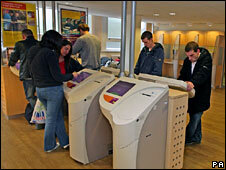 The figures provide evidence of the rapid slowdown in the UK economy and suggest unemployment rates will rise. "The UK jobs market is heading downhill at breakneck speed," said Mike Stevens at KPMG, a sponsor of the survey. The report also showed record survey falls in permanent salaries and temporary staff pay rates. "Employers in almost all sectors have drastically cut recruitment plans and are shedding contract and temporary staff as fast as they can," Mr Stevens added. Permanent placements declined for an eighth consecutive month in November, with the rate of contraction accelerating to a new survey record. Temporary and contract staff billings also fell by record levels, as did demand for permanent and temporary staff. The only sector to avoid the downturn was nursing and medical care. Unsurprisingly, record rises in staff availability were also recorded. The monthly survey, sponsored by the Recruitment and Employment Federation and accountancy firm KPMG, features original data collected by Markit Economics from 400 UK recruitment and employment consultancies.